I'm kinda in hurry so have to be short. Hikashu will perform at Shibuya Quatro on December 26th. Guests are Inoue Makoto (synthesizer), Yamashita Yasushi (synthesizer), and Tobe Satoshi (alto saxophone, vocal). Yes, the original Hikashu's reunion. And Chikada Haruo, who was the producer for Hikashu's 1st and 2nd album, and Soutaisei Riron (the band), also will participate. Surely, this is going to be a special night. While I haven't a chance to listen to it yet, Ten Ten Ten already starts earning some reputation. For example, at Jazz Tokyo (the popular jazz site), Ono Seigen picked it up for the album of the year. Ono, the internationally renowned musician and recording engineer, did the mastering of the album (and the Gaspacho single). And he commented that, because of his job, he listened a lot of records, and Ten Ten Ten is exceptional, far superior from the rest. He also witnessed the Hikashu's performance in Shibuya last October, and quite impressed. He expressed that he will use some excerpts of the album for his presentation at industry conventions. Hikashu appeared as the last act of the day. As usual, the band kicked out their set by Ikirukoto. The biggest surprise was Love Treatment. The song, from the first album, rarely played these days. Melancholy in Global City started by short but sharp bass intro, and featured extended jam. The place was packed and the crowd was enthusiastic. Short (almost an hour) but nice performance. The photos of the event are here (just scroll it down). It was manifique, memorable night. Although the weather was bad, the atmosphere was quite intimate. Makigami was with no gadget. No theremin, no cornet. He stood bare, before the microphone, and just used his voice. Also occasionally used Jeu's harp and ukulele. Lots of very familiar songs were performed. Of course, most of them are from the recently reissued Cho-Kayou albums ("Minzoku no Saiten" and "Koroshi no Blues"), but some numbers were unrecorded yet, or pretty obscure ones. For example, "Heisei Jaran Bushi" and "Karyo-binga", both from the rare 1990 solo single, were chosen. Also, "Soshu Yakyoku" (蘇州夜曲）, a 1940 classic song by the great composer, Hattori Koichi were included. In the middle of a song, Makigami did some conduction à la Frank Zappa, and it was nice accent, adding the concert some dynamism. Indeed, it was quite different from ordinary, full-of-nostagia show. The band was tight. Mita sang the first two verses of "My Blue Heaven" (as the same with the album) so well that Makigami just praised it very much after the performance. Cellist Shika also played alto saxophone. And I found the most noteworthy is Sato's accodion. His play was pretty effective. It enhanced very good, old-timey atmosphere, which was well-suited the situation. Overall, it was success, and Makigami revealed he intended doing the concert again in near future. Can't wait. This is a sort of precursor for Ten-Ten. At that time, Makigami just started using Theremin in public. It took him years of preparation, and he formed this group as a kind of proving-ground. Improvisational electro tracks with guitar and bass. Plus Makigami's voice and theremin. Do not expect this typical electro music. Quite the contrary. Kinda fierce and noisy, lots of interplay. Never dull, very dynamic, and full of instinct. A likeable kind of electro, I'd say. An interesting and fresh approach from Hikashu people. Hikashu started their set by Mita's singing, accompanied only with his guitar. I don't know what it is but it seems it's very old song. Also, a tune from the new album were performed. It was called Justrius (sp?). 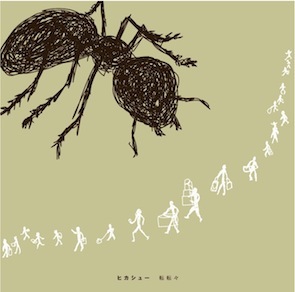 Makigami cited its lyrics, backed with collective improvisation. He said he wrote it in Norway, and the album was still in works. They did two encores that day. Last encore, the drummer Sato have to leave early so he was not present. The band played "The Curry Master" sans the drummer. 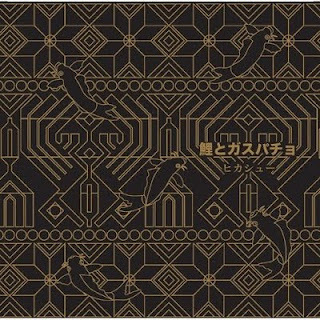 On December 1st, Makigami has reported on twitter that the master of the new album, Ten-Ten-Ten, was sent to the pressing factory. It is going to be released on December 20th. Hikashu office now accepts pre-order. You can hear a snippet of the album on Hikashu's MySpace account. Access here to listen to "Nicoselon." Also "Melancholy in Global City" from the Gazpaccho single is now available on the account. Here. and the scenic shot of Cáceres, Spain. Makigami visited Spain in summer this year, and probably shot the video for himself. "... one of the defining bands of Japanese new wave and technopop ..."
I just found Japan Times has some interesting articles about the Drive to 2010s event. One of them also features a photo of Hikashu from 1979.
Notable for Koichi Makigami's distinctive, Kabuki-influenced vocal style, Hikashu were, alongside P-Model and The Plastics, one of the defining bands of Japanese new wave and technopop, although from their poppy debut they quickly tacked in a more experimental direction. At Drive to 2010 they are notable for being one of only a handful of artists to perform at all three "Drive to . . . " events. I would like to note, at that event, Hikashu is the only band which never cease to exist during those 30 years. What does the word "Hikashu" mean? The name Hikashu was originally conceived and endowed by an original member, synthesizer player Yamashita Yasushi. It is not conventional Japanese word. So if you ask it nearby Japanese, you would probably never get any likely answer. Yamashita has never reveal exactly what it is, and its meaning is still subject to debate among the fans. 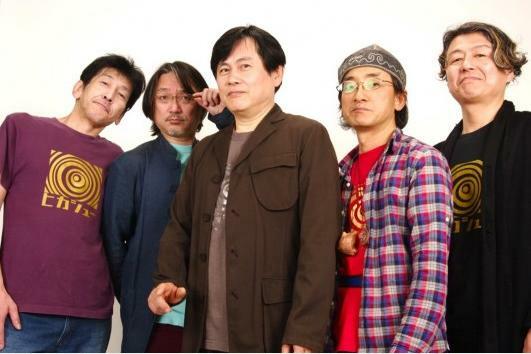 The Model Plants, a Japanese new wave band formed in 1984, will come to an end this year. The group also has hosted a December event entitled "Merry Electric Christmas" for years, and 2009 will be the last. It's two days event and Hikashu will perform on the first date, December 5th. Cho Kayou （超歌謡） is a term which Makigami used for his way of interpretation of Japanese songs. In "Minzoku No Saiten" (1982) and "Koroshi No Blues" (1992), Makigami covered popular (and obscure) Japanese songs, most of them are from 1950-1970. There are so many "Japanese songbook" albums in the market, but those two albums are clearly stood out, for the songs' selection (which really reflected his eclectism), and its unique and fresh approach for each song. In the past, Makigami did a series of live concert under the Cho Kayou concept, which he called Cho Kayou Live. And the latest date is coming on next month. Recently he did not Cho Kayou thing so frequently, and this time play with Hikashu people, so this is a truly rare treat. Should not to be missed. Note: "Minzoku No Saiten" and "Koroshi No Blues" are going to be reissued late this month. Meteor is an artists' unit of music and CG animation from Asakusa, Tokyo, formed in 1996. Musically, they took an unique approach, trying to integrate western pop and japanese traditional music. They are also prolific CG creators, and won many CG-related awards in the past. The CG works are featured in their live performance, too. 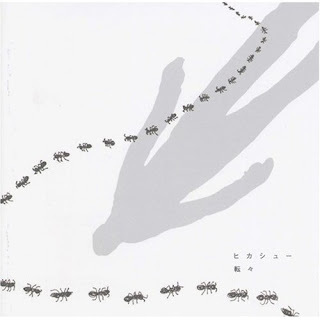 The first album, Chemistry of Children (1999), was produced by Hikashu's bass player, Sakaide Masami. Meteor invite Hikashu as guest at their live set. Speaking of Ten Ten, it's a nice album. If you were interested in improvisational side of Hikashu, you should get this one. All improvisation. A lot of interplay, strange voices, and weird wind-like sounds of thermin. Full of twist, thrill, and humor. Here's background: In 2006, the Stone, a live venue in NYC, planned to do "the Makigami Koichi week." Makigami accepted the offer. He decided to devote Hikashu a day, and do some recording with the band in the city. Since keyboard player Shimizu couldn't make it to NYC, and they just wanted to do that way, the band decided to try entirely improvisational approach for the recording. And they made it. It turned out pretty well. They even didn't change the recording order for the release. So the track sequence of the album is the same as the recording proceeded. I think there're not so many other bands than Hikashu could do the thing like this so splendidly. Of course, it was not easy thing to do. Makigami admitted that it was exceptional, even for Hikashu. And fortunately, they succeeded to capture the crucial moment. It's 1978. Hikashu members lived together in small house at residential area of East Tokyo, listening records of Kraftwerk, Brian Eno, Derek Bailey et al., and doing some experimentation. Then they recorded a demo and passed it to Chikada Haruo, musician and record producer. Chikada immediately loved the tape and next day he phoned them to tell that he want to produce the band. The demo was finally issued as "Hikashu 1978" in 1997, and it verified they were practicing lo-fi music when the term did not exist at all. Many fans prefer the tape to "produced" version. Hikashu in 2012. From left to right: Shimizu Kazuto, Sakaide Masami, Makigami Koichi, Mita Freeman, and Sato Masaharu. Makigami and Mita are original members. Sakaide joined the band on December 1982 (before then, Makigami played bass), both Shimizu and Sato in 2003. Outside Japan, I recommend Downtown Music Gallery in New York City. They have stocked recent Hikashu releases and doing mail order. They also accept orders outside USA. Their catalog is pretty impressive - just take a look at their site, then you will know what I mean. Also, regarding in-print titles, I putted links to HMV Japan (English page) in Discography page. They provide English menu and accept foreign orders. Hikashu is an avant-pop band from Japan, formed in 1978, never disbanded, and still going strong. They are everything. Well-written compositions, masterful improvisation, mystique voice, openness, and absolute sense of humor. I will write this blog for foreign audience. Comments, corrections and feedback are welcome.